Oxford University has offered more places to women than men for undergraduate courses for the first time in the history of the institution. 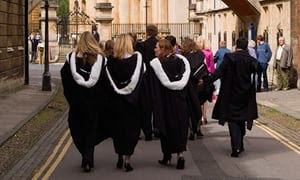 The university offered places to 1,275 female 18-year-old applicants and 1,165 to male applicants last year, according to data from the admissions service Ucas. The figures show 1,070 women won undergraduate places to start at Oxford in September, compared to 1,025 men. The data also shows of applicants of all ages from the UK, women received more offers to study as undergraduates than men, despite fewer applying.